Sour milk product is obtained through acidification of milk through bacterial fermentation. Nowadays, there are two ways to get sour milk – you can either buy sour milk manufactured by dairy industries from a store, or you can make it at home yourself. But we should keep in mind that milk in a closed package with the use-by date passed, or that has been kept in non-compliant conditions doesn't ferment into sour milk at all. All you will find in the package is a liquid with an unpleasant smell and a disgusting taste. You can make sour milk from raw milk at home. In this case, the fermentation process takes place spontaneously if the conditions are right. • 1 liter/4 cups plain dairy milk. • One serve (50-100 ml) (1/5 to 1/3 cup) of other fermented milk drink. Clean all containers and equipment with hot water. This should kill any bacteria that may contaminate the milk. Prepare a warm place for the milk to ferment. Mostly a warm spot away from direct sunlight. Heat the milk until it steams, do not let it boil. This is to kill any bacteria already in the milk. Once it is cool enough that you can touch the side of the vessel for ten seconds comfortably, use a funnel to transfer the milk to your container. Try not to get milk on the rim of your container as is may provide a pathway for unwanted bacteria. Add your fermented milk to the container and close the lid, give it a shake and place it in the warm place you prepared earlier. Leave it out to continue curdling and loosely covered. Let the milk incubate for 12-14 hours, try not to disturb it and do not open the container yet. The warm, clean conditions should let the beneficial bacteria grow and ferment the milk. Open the container after 12-14 hours. 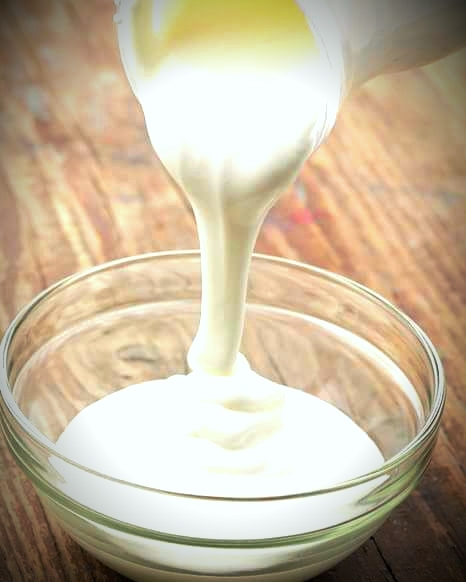 The fermented milk should be about the same colour as normal milk and be only slightly thicker, it should have a mild yogurt smell with a hint of tang and a smooth slightly tangy taste. Chill immediately in the fridge. Add sugar to taste before serving. Two to four teaspoons of sugar per cup is about normal. Enjoy!